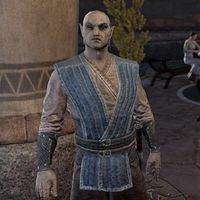 Vorar Vendu is a Dunmer who can be found in Saint Delyn Plaza in Vivec City. He is waiting impatiently to receive an audience. "You with the Temple? If feels like I've been on that s'wit's waiting list forever. Tell Traylan I still need someone to help us with this job." "You're our hired infiltrator? I suppose you'll have to do. It's good you decided to talk. The Camonna Tong aren't a group you want to tussle with before gathering your information." I've been asked to investigate activity at Khartag Point. What can you tell me? "What do storied Covenant heroes and Camonna Tong cronies have in common? Apparently the region's illegal slave trade. The seaside cavern Khartag Point is drowning in rumors as of late, and I need to figure out what's fact and what's fiction." The rumors are true, the Covenant hero's tale recently ended inside. "Bound to happen. Those involved with the Camonna Tong are not known for long, happy lives. Well, at least he had an impact. Why else would the cavern be named after him? Regardless, it's the slave activity we need to assess, not some dead Orc." "Well, just one we know of, the Orc Commander Khartag. We've learned that he and his raiders are somehow involved in slave smuggling. In what way? We're not exactly sure. But he seems to have caught the attention of the Camonna Tong." I'd like to know more about the Camonna Tong. "The Camonna Tong are slavers, murderers, extortionists, everything a vile crime syndicate can be. They don't like Outlanders, especially ones who cut into their profits. Tread lightly in Khartag Point, it's crawling with their cronies." Why are you concerned with Khartag Point? "I once ran with the Camonna Tong. I wised up and got out, but not before seeing what kind of scum they truly are. When my business partners came to me with this issue, I said I'd take care of it. I'm more than happy to take the fetchers down a peg." "One, two, three, four .... Yup, seems like you still have all of your limbs. I guess that means you were able to do the job?" I killed the Camonna Tong commander and retrieved evidence of their illegal slave trade. "This is one of those times I hate to be right. Was hoping someone would run them out of the cavern honestly. I'll let my business partners know, and we'll decide what to do from here. Thanks for the help." "It's not just anyone who can tussle with the Camonna Tong and walk out with all their fingers intact. You obviously know how to handle yourself." This page was last modified on 13 February 2019, at 02:29.